Teacher's Highland Cream is a brand of blended Scotch whisky produced in Glasgow, Scotland, by Beam Suntory, the US-headquartered subsidiary of Suntory Holdings of Osaka, Japan. The Teacher's Highland Cream brand was registered in 1884. (The label on the bottles says "est. 1830", reflecting an earlier date when the founding family entered the whisky business, before the brand name was created.) Teacher's states that it uses 'fully smoked peat single malt whisky from The Ardmore distillery as its fingerprint whisky' along with about 30 other single malt whiskies. Most of the output of the Ardmore distillery is used to produce the Teacher's brand. 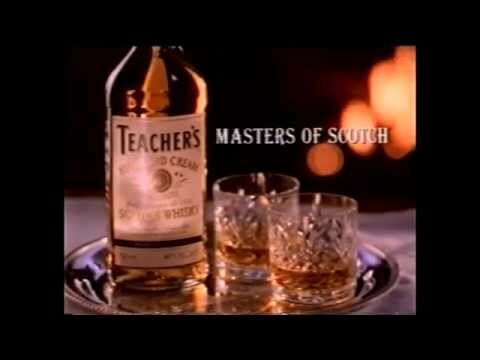 Teacher’s boasts a deliciously smoky flavour, a result of our high peated malt content, proportionately the highest malt vs most competitive blends. Discover the distinctive style and flavour of Teacher’s® whisky with Master Blender Robert Hicks.